So I had my ultrasound on Monday and rainbow looked really good! Heart rate was 119 and measuring right on schedule! The tech couldn’t tell me anything else because of hipaa regulations. So today I had my first OB appointment. The nurse did my questionnaire which took probably all of 20 minutes. Then the doctor came in with a huge grin on his face and told me congratulations. He asked if I wanted to take a peek at the baby on his office ultrasound no charge! So of course I said yes! (My doctor is beyond awesome guys, seriously.) So they let me change and came back in for the u/s. 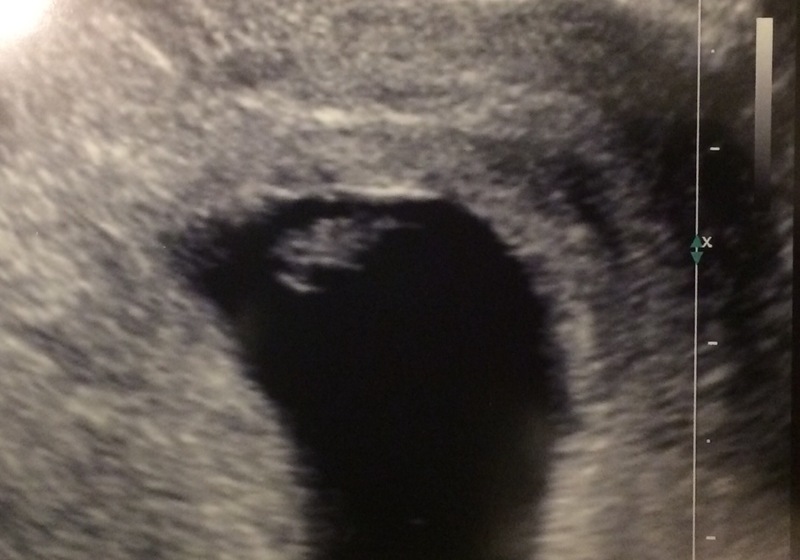 Baby still looked perfect and we could see its little heart beating away! Then the doctor said “I really just wanted to double check something that the radiology report said.” I immediately got super nervous as he explained to me that the radiologist noted that my gestational sac was measuring at 12 weeks but the baby was only at 7. He assured me the baby is fine since we are positive of conception date but he said the large sac size could mean a few things. 1) the progesterone suppository that I am taking could be vamping up the growth rate in there. 2) there could be another baby. Or 3) vanishing twin syndrome. He said there’s no way to distinguish between option one and three but as of right now, all he can find is one baby. He wants me to come back in 2 weeks instead of four to check again and see if there’s still just one. He is particularly looking for two babies because my HCG was rising very quickly in the beginning which can be normal but it can also indicate twins. While he was explaining all of this to me all I could think was oh my gosh we might have twins. so I’m nervous and excited all at once. I go back January 14 for another visit and I will have my prenatal blood work up done then. So far symptom wise I feel pretty good. Still having some nausea. I think most of the time it’s hunger pains that make me feel nauseous. Still having food aversions too. My heartburn has calmed down a little but not a lot. I feel like about every other day I am exhausted. Not that I over exert myself the other days but it just hits me one day and all I want to do is take a nap, roll over, and take another nap. Then the next day I’m better. I am still having some sleeplessness but it is fading and being replaced with strange dreams. Other than that, it’s all about the same. I do feel like I have popped a little. Not like I look prego but like down low in my pelvis is starting to stick out. And after today I know that it’s legitimately sticking out and not just in my head. Wether it’s twins or just one, my gestational sac is still large and protruding. I hope you all have a Happy New Year and be careful celebrating tonight. I am celebrating by hitting the sack early. It’s my turn to work this holiday so I get to wake up bright and early tomorrow! Yippee! This entry was posted in Family in the making and tagged angel baby, baby, beta, BFP, blogger, desires, faith, God, hcg, hope, husband, insulin resistant, PCOS, pregnancy, Pregnancy after loss, week by week. Bookmark the permalink. ← Bump day week 6!